Following a week of great significance in the UK welterweight ranks, there appears, as ever, more questions than answers	. After a tumultuous period since his high profile win over ‘future superstar’ Shawn Porter last August, Kell Brook returned from his career threatening leg stabbing injury against IBF mandatory challenger Jo Jo Dan. Whilst the Canadian based Romanian brought heart and desire to the ring, it was evident early on there was an ocean of class between the pair. Eventually seeing off his challenger in the fourth round following an equal number of knockdowns, Brook didn’t even need to be at his best on this occasion, and seemed to show no signs of any lingering problems with the leg. The post-fight interviews included the inevitable calling out of Amir Khan, a natural fight in everybody’s eyes, unless your named Amir Khan or Al Haymon! The last few days, though now questioned, it appears Khan has elected to box Chris Algieri; a brave, well schooled operator, though clearly not of the elite calibre Khan likes to tell us. Coming off a completely one sided shut out defeat against Manny Pacquiao is this really a suitable opponent for the man who tells us he’s next in line for pound for pound kings Floyd Mayweather Jnr and Pac-man? Unfortunately for fight fans it has become apparent Khan is buying into his own hype, some will call him a cherry picker of opponents, all the time his ego telling the world he is the best welterweight out there. Don’t get me wrong, there’s nothing wrong with ego, but it has to be backed up, a la Mayweather. 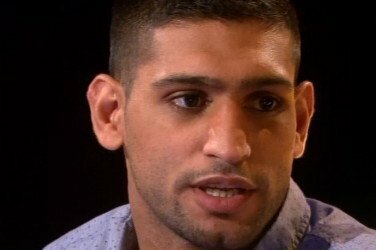 Despite not winning a world title fight since July of 2011 and never avenging any of the defeats on his record, Mr Khan feels he is at a level to belittle the advances of the Brook camp for a bout. Harsh I may be but is the man deluded, as good as Khan is, and he is, how can he possibly point to Brooks recent opponents as being subpar when he is not fighting the big guns himself. Merely tiptoeing around the elite hoping to position himself for the massive pay days the p4p kings bring. It is clearly good business sense from him and Al Haymon but what about the fighter and his legacy? Does he want to be remembered as someone who avoided the best fights because he and his team didn’t trust his chin? Brook holds a legitimate world title,why won’t Khan accept the opportunity to become a two weight world champion and relieve him of the belt he’s apparently so capable of taking? Surely he’s made significant enough strides under Virgil Hunter to be let off the leash somewhat . His performance against Devon Alexander was skilled, disciplined and consummate. Now is the time to move forward. In reality Floyd and Manny aren’t going to be future opponents unless he proves himself in the welterweight division, of which he hasn’t yet. All the time Kell Brook is gaining a strong fan base and a growing interest from the states with Showtime broadcasting his last two fights. So who wins the UK’s biggest current potential scrap? There are strong arguments for both, if Khan stays away, uses his speed and adopts another disciplined showing as he demonstrated primarily against Andreas Kotelnik and Devon Alexander, as previously mentioned, there is every possibility he gets the UD win. The other perspective though is sooner or later he finds himself on the end of a Brook right hand, and that may not end well for the Bolton man, Kell has great timing and you just wonder if Khan can avoid being caught for the duration. One thing that can’t be disputed is this is a great fight for the British fans and the sport in general, whilst currently enjoying a great resurgence in the UK, bouts like these must be made to maintain the momentum. So please Amir Khan show us what you’ve got.